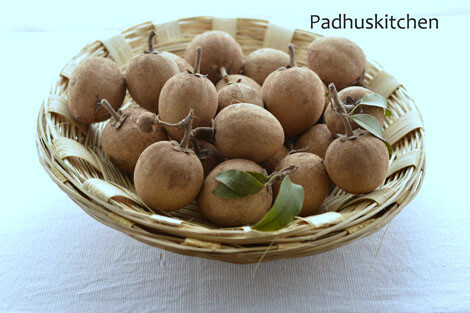 I was so excited when I harvested these sapodillas (sapota in Tamil and cheeku in Hindi) from our tree. I wanted to use it in my recipe, so I did this fruit and nut salad and added the sapodilla with the skin as it is rich in fiber and also I know that I did not use any chemical fertilizers or pesticides.I used only compost from my kitchen waste. This fruit and nut salad is full of colors and is packed with nutrients. Remember I had written about the rainbow diet in my last salad recipe and had written that you must include lot of colorful fruits and vegetables in your diet to lead a healthy life. I do not prefer adding oil or cream to my salads. 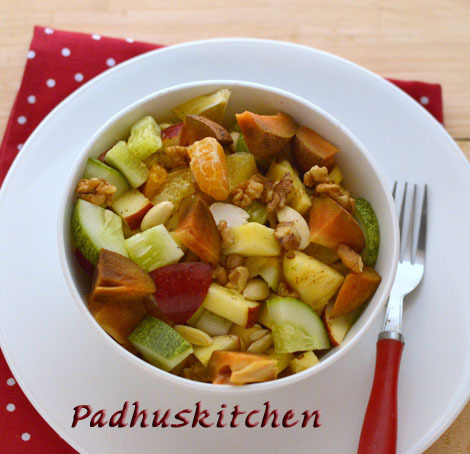 So here is my way of preparing Fruits and Nut Salad . Clean all the fruits and chop it into cubes. Keep it aside. I had this whole bowl of salad as snacks yesterday evening and did not feel like eating dinner. It kept me so full. 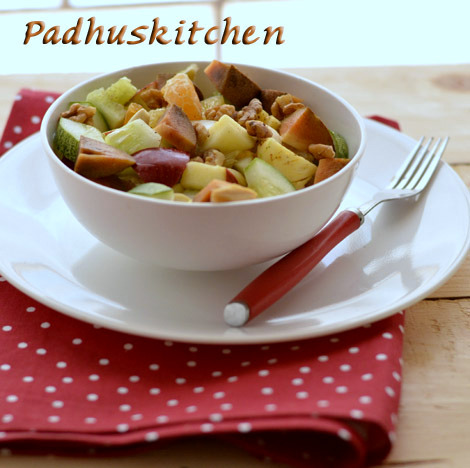 Enjoy preparing this salad and pave way to better health. Note - You can add sprouts to make it more nutritious. Learn how to sprout beans at home. You can also add few paneer (Indian cottage cheese) cubes if preferred but that will become too heavy. Learn how to make paneer. You might love my Fruit Custard Recipe also. This is my favourite fruit ever. looks great paddu! I love chikoos Padhu and how can someone even refuse a bowl of this goodnes? wow healthy n yummy salad! Simple and healthier padhu akka. I can have this at my breakfast..colorful salad. What is the tamil word for sapodillas akka? I saw this in India but didnt get the name. Thank you for this valuable post akka. i will blush everyday if am having this - so yum! your chickoo's from your garden are awsome. Ohh...So colorful and healthy dish..
Wow congrats on your fruit crop...delicious fruit salad looks delicious. Oh, my goodness you have harvested it, lucky haan. I liked the first pic..